There are many benefits to making the switch to a paperless office. There are financial and environmental benefits to be had from this transition. This article will detail the best things that come with a paperless office. Some of these effects may not be expected on the surface! More space: No one wants to work in a cramped office. It’s both uncomfortable and not stylish. Many modern offices feature an open layout with an airy feel. A paperless office will allow you to achieve this look. Don’t forget eliminating stacks of paper on your desk! You’ll have more desk space without needing to purchase a new desk. Increased efficiency from sales staff: Sales are the lifeblood of any business. Moving to a paperless office can make your sales staff more efficient by eliminating the hassle of dealing with numerous paper documents. No need to mail out quotes or RFPs. Send these by email and increase the number sent per day. Additionally, being paperless makes it easier for your sales staff to track important documents. Look cooler than your competitors: People like technology. If your competitor has an office filled with filing cabinets and hard copies, they might look old, stale and out-of-touch. Avoid this perception by utilizing paperless technology and appear modern to your customers. Save money on office expenses: No more spending tons of money on reams and reams of paper. You might occasionally need to print a document, but with a paperless office, you’ll be spending considerably less on paper than if you chose to keep using paper. This will help you save money on overhead. Increased customer satisfaction: Keep your customers happy by serving them faster with a paperless office. A happy customer is a returning and spending customer. Save money on office space: Wouldn’t it be nice to be able to maintain the same or better revenue streams, but reduce the amount you spend on rent? A paperless office can save you the need of hundreds of square feet for filing cabinets, allowing you to save on rent in a smaller office. Simplicity: A paperless office system doesn’t need to be complicated. You can set up a server with well-organized folders; your employees will be able to find what they need in an efficient manner. Return on investment: It can be a somewhat costly investment to switch to a paperless office, but the most important thing to remember is this investment will bring a return. The money you’ll save over time by making this smart switch will make it worth it in the long run. You’ll likely also be able to increase your revenue because your sales staff will be more efficient. formsRus specializes in creating paperless office solutions for clients in the United States and Canada. 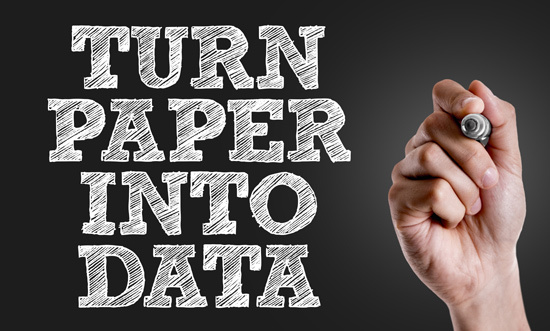 For more information about how we can help your business make the transition from paper to paperless, contact formsRus today. Is your business still using a traditional fax machine? You might be surprised to learn there is a better way to get the same results, but at a lower cost. This method is web-based faxing. There are several key benefits associated with web-based faxing. Affordability: A standard fax machine requires a phone line, which is a business expense. You’ll also have to pay for machine maintenance and toner refills. These expenses add up over time and can sometimes be unexpected. Imagine if your fax machine breaks. Is that a potential expense you’ve accounted for? Web-based faxing, because it only requires an internet connection and a device connected to the internet, has both fewer overall expenses and fewer unexpected expenses. Confidentiality: A traditional fax machine might be used by several people. Are you sending a fax that is only for specific people? Your office fax machine probably isn’t the best place to send this information; it’s impossible to know who might accidentally stumble upon the document. Internet-based faxing is much more secure because the faxes are sent to a private email. Green: Cut down on the amount of paper you use with web-based faxing. You’ll help the environment and save money spent on paper. Convenience: To send a traditional fax, you need a physical fax machine. This takes up both office space and money. You also have to waste time waiting for faxes to come in. With an internet fax, you can continue working on your tasks. 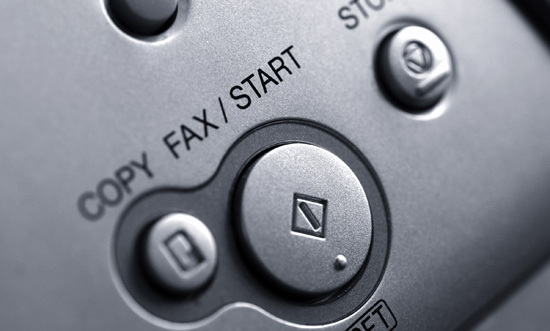 Efficiency: If you aren’t using web-based faxing, you can only receive one fax at a time. However, online fax services can receive multiple faxes at once. Additionally, web-based faxing can increase office productivity. Time management: Your employees will waste less time waiting for faxes to arrive. This time can be better used helping your company succeed. Accessibility: Faxes can be sent anywhere, anytime from any device with an internet connection. If an employee needs to work from home, he or she can, and still send faxes over the web. Less costly: With the money you’ll save by not having a dedicated fax line, fax machine maintenance and monthly bills, you can improve your company by putting the saved money into employee enrichment programs. formsRus works with UFAX to provide web-based faxing solutions for its clients. For more information, visit http://www.ufax.net/ or call us at (800) 955-6284. When Should I Invest in a Paperless Office? If you feel like your office is drowning in paper, it’s time to consider an investment in a paperless office. Going paperless can do wonders for your business’s processes, procedures and, ultimately, its bottom line. The question facing many businesses is not if they should go paperless, but when to go paperless. It’s not an easy question; the answer is different for every business. However, there are a number of telltale signs it’s time to make the switch. Competitors have made the transition: Business is competitive. Everyone is trying to get an edge over the competition. Your competitors have an edge over you if they’re paperless and you’re not. It’s time to eliminate that edge. Paper expenses getting out of control: It’s a well-known fact that paper is expensive. Time to take a close look at just how much you’re spending—and how much you could save by going paperless. Office falling behind in technology: People want to work with the best, brightest and newest. If your office is using technology customers perceive to be outdated (or have eliminated in their own offices), you won’t look your best. Excessive number of file cabinets: Does it feel like a forest of file cabinets in your office? If so, it’s time to transition to paperless. File cabinets take up valuable space that can be better used to grow your business and better serve its customers. Having too many file cabinets makes it difficult to find documents once stored; employees will waste time on scavenger hunts for papers. Poor customer service: If you’re noticing an uptick in the number of customer service complaints, this could be a sign you need to switch to a paperless office. Paper-based offices tend to have slow service. Customers have to be placed on hold while staff searches through piles of paper to find what they are looking for. This problem can be mitigated with a paperless office and software designed to locate documents. Shrinking office tables: No, not literally. But if you’re noticing the amount of desk space in your office decreasing because papers are piling up, consider it a sign you need a paperless office. Soon, you won’t have any desk space—just a mini skyscraper of papers! 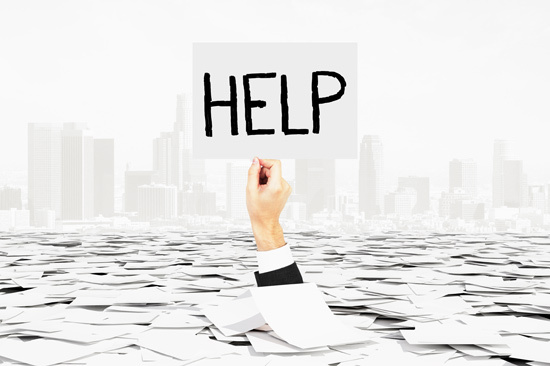 Losing documents: It’s every business owner’s worst nightmare. You misplaced a crucial document and have no way of knowing where it is. This is especially true with paper documents. Once you misplace it, it’s often lost. With a paperless office and tracking software, you’ll always know where your documents are. Low efficiency and productivity: One of the biggest time-wasters in the office is mindless searching for papers. Paperless offices can put hours of time back into your employees’ weeks by converting wasted hours into productive hours. If you’re wondering why a 7-hour-job is taking 12 hours, always consider the amount of time wasted by searching for papers. If any or all of these things are happening in your office, it’s time to give serious consideration to a paperless office. 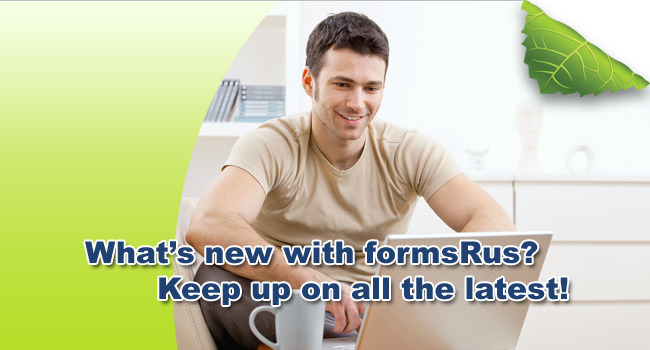 FormsRus has great paperless office solutions for companies of all sizes. For more information on our paperless office services, contact us at (800) 955-6284. We’ve elaborated on the many in-office benefits of using a paperless office, but there are positive effects outside the office, as well. Paper manufacturing is destructive to the environment in many ways. Paper product manufacturing contributes to deforestation, climate change and greenhouse gases. Each of these three things negatively contributes to the environment. According to the American Forest & Paper Association, paper manufacturing is the third-largest user of fossil fuels worldwide. Think recycling is effective? Think again. Most recycled paper winds up in landfills. In fact, paper accounts for almost half the waste in landfills. Paper production produces a lot of pollution, because manufacturing releases gases like carbon dioxide. Besides the actual production of paper, printing inks and toners negatively impact the environment because they use environment-damaging materials. Now think about how much paper you use in your office. How much are you contributing to harming the environment? Pulp mills, where the paper manufacturing process begins, pollute the air, water and land. Worldwide consumption of paper continues to rise at rapid rates. Paper consumption rates have risen 400% the past 40 years. The paper you use goes beyond the paper in the printer. Do you have paper cups in your office? In the United States, at least 6.5 million trees are cut down yearly to make 16 billion paper cups for coffee consumption. Deforestation is a contributor to global warming. Fewer trees means more carbon dioxide and other unwanted gases in the atmosphere. Global warming is an issue which could drastically alter the planet’s habitability in future years. Deforestation causes carbon dioxide to linger in the atmosphere. This bears repeating because it is a major problem for the reasons described above. Deforestation makes flooding and landslides more likely. When trees are removed, there is less water available in the soil and groundwater. This means there is less water for the remaining trees. These problems compound themselves with less-cohesive soil, leading to more floods and landslides. Deforestation is damaging for species that live in the targeted areas. It is estimated 52,000 species per year become extinct from deforestation. For paperless office solutions, contact Forms R Us. We can be reached at (800) 955-6284. Considering Going Paperless? Here are the Positive Effects! A growing trend in offices is going paperless. Reams of paper are being replaced with folders and documents on a server. Consider some of the benefits of going paperless. Document organization: If you need to find a document, either internally or for a customer, it will be quicker to pull it up electronically than look through filing cabinets. Many companies have hundreds of filing cabinets across the office. It’s easy to look in the wrong place or misfile a document. Paperless mitigates these problems. Improved client communication: There are two aspects of this: speed and money. Communicating via email is faster than traditional mail. For example, sending an electronic invoice is easier than sending a paper invoice. Financially, it is less expensive to send documents electronically because there is no need to pay for postage. Small postage fees add up over time. Access to documents: It’s easy to retrieve files when they are organized and saved electronically. When traveling for business, you can pack lighter because you don’t need to carry paper. Data security: When you go paperless, you can create electronic backups via a cloud or other system. When you store paper, if it is accidentally thrown away, it’s likely gone forever. Environmentally-friendly: Everyone knows making paper is not good for the environment. Recycling can be expensive. Going paperless solves both of these problems. Financial advantages: Think of all the costs associated with paper. Costs go beyond the actual paper. You have to buy a printer and ink, plus a copier. When file cabinets get filled up, you have to buy additional ones. Compliance and storage: Changes can be made to the original document, and you can keep the original document. This can be beneficial for any company audits or other compliance issues. Saved time: You’ll no longer have to waste time looking for documents that may have been lost or misplaced. Don’t underestimate the advantages of saving time. If you spent 30 minutes trying to find a misplaced document, that’s 30 minutes you can’t spend on important business tasks that could bring revenue to the company. Simplicity: Most everything is better if it’s simple. Rather than adding steps to invoicing customers with actual mailing, consider electronic invoices. This process can be done from a computer with just a few clicks. Business development: Related to saving time, business development is an overlooked advantage to going paperless. Even 30 minutes a week saved by not having to locate paper documents and instead devoted to business development adds up; think how you could improve your business if you had 26 extra hours a year to devote to business development! That is possible when converting to a paperless system. Security: Paper documents can be hard to track. For example, if the filing cabinet is left open and someone makes off with a sensitive document, there’s no way to track who has it. With paperless storage, access to documents can be limited to certain users, increasing the level of security. One of the most important aspects of any investment made in a company is the return on investment. Is there expected to be one? How quickly will it come? How big will it be? Paperless offices are a smart investment for any business of any size. Is There an Expected Return on Investment? The answer is yes! The time and money you’ll save by switching to paperless will pay for itself over time. How Quickly Will the Return on Investment Come? This depends on your business. If you need to convert hundreds of thousands of documents in a multi-million dollar business to an electronic system, the cost will be higher than for a small business. As such, it may take longer for the larger business to recoup its investment. How Big Will the Return on Investment Be? This also depends on your business. A larger business can expect a higher dollar amount returned than a smaller company. Eliminate paper: No more stacks of paper with hard-to-read handwriting. No more weekly trips to the office store to fill the printer with paper and ink. No more money down the drain for repairs when the printer breaks. 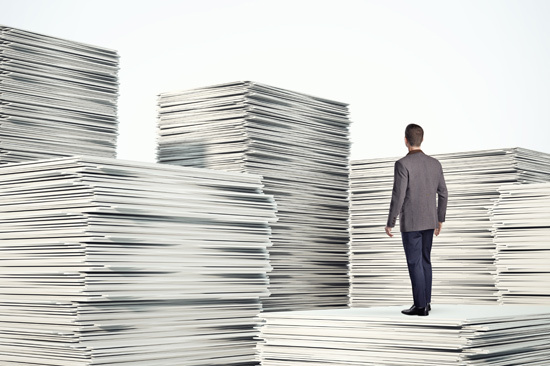 Eliminate paper document processing and storage: It takes time to file paper. Then it takes time to find the papers you need. 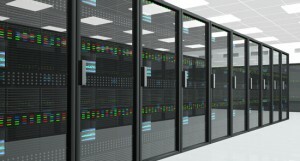 These dual problems can be solved with searchable documents stored on your servers. Reduce manual entry time: Many paper documents still need to be entered into the computer. Interactive forms don’t need to be because that step is included with the entry of information onto the form. Document organization: Instead of digging through files to find the right one for client meetings, organize the files on a server with a search function to save administrative time. Quicker, less expensive client communication: No need to send snail mail when email and other forms of electronic communication are available. Paperless communication is usually more-easily documented than traditional mail. Automatic backups: If you accidentally throw away a piece of paper you later need, chances are that paper is gone forever. 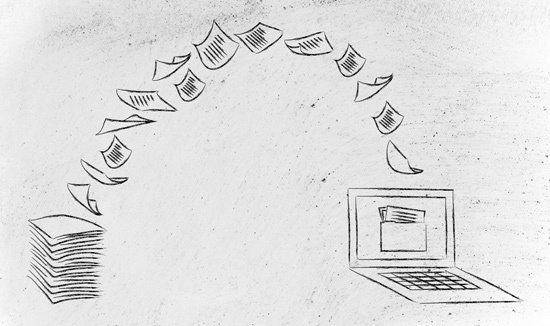 When you go paperless, you can use automatic backups to ensure accidentally-deleted documents can be retrieved. Data security: Cloud-based systems have security settings to ensure your data isn’t compromised. When you break it all down, interactive forms save you time and money in countless ways. Perhaps more importantly, they can help spur a paperless transition, resulting in even more savings. Remember to use quality interactive forms! They should work on any device and any browser and not require special plugins or software. A good interactive forms and contracts system should have a suite of editing and overlay tools available. It should be able to auto-fill data from other sources as required and perform mathematical computations. We live in a world of large amounts of data. Files are everywhere, both for business and personal use. You need these files to be secure; file loss can be catastrophic. In order to prevent this type of loss, you need to have a form of backup. One of the most popular forms of document storage is file hosting. A file hosting service, as the name implies, is a designed to host your files. The files are then made accessible from the internet via whatever device you may be using: computers, laptops, tablets, phones and the like. It is extremely convenient for both businesses and professionals. Pay for the storage you use: With file hosting, you’ll only pay for the space you use. This is different from a hard drive, for example. With a hard drive, you’ll pay for the whole thing—regardless how much space you use. Indirect cost savings potential: You don’t have to only use online backup. You can still store some data on a hard drive or other storage device. However, storing data online has indirect cost savings potential because local storage is more-easily destroyed. Online storage can indirectly save you money because it is easier to recover in case of a disaster. Security: Online storage is often more secure than other forms of data. If you store data locally and have a disaster (such as a fire), the data can be lost. This type of disaster is impossible with online data; even if your office burns down, you can recover your data online. Automation: Have you ever put off backing up your data? Most people have done this at least once, and many people do it regularly. With online storage, just choose when you’d like the data backed up and it gets done! Most people choose to do this at night or when the computers are not being used. File syncing: Enjoy the convenience of having your files synced across devices. Work on your computer and take the work with you on your tablet and smartphone. Recovery: Regardless of the type of disaster, you’ll have backups of all files so you can restore them and get back to work quickly. The next time you need data backup, consider using a file hosting service rather than local storage. Contact us today to find out more! It can be scary choosing an electronic software. There are security and quality issues to worry about. It would be devastating to choose the wrong software. There are a multitude of things to consider when choosing an electronic software. While there are hundreds (and perhaps thousands) of things to ponder before signing up for electronic software, there are five that are most important. This should probably be the most important factor in your decision. What’s the point of investing in “secure” electronic software if it isn’t actually secure? Reviews, testing and trials can help you correctly evaluate the security of the software. Make sure you feel confident in the level of security offered! Any software you choose should work with all your systems and devices. It is often a big investment in electronic software. You don’t want to choose incompatible software and have to upgrade or replace your hardware. Always read and double check the technical specifications before making a final decision. This goes for both you and your clients. People want something that won’t confuse them. You’ll likely lose customers if your software is complicated; they might go to another company offering easier-to-use programs. It is also important the software be easy for you to use. You might as well not spend the money if you won’t be able to use your electronic software. In both branding and integration, you want to be able to make the software your own. You should be able to make the user interface fit your brand. Additionally, it should make sense to use the software in your company where you want to use it. Don’t force software into the company if it won’t fit. Without this feature, the effectiveness of the software is diminished. FormsRUS offers software that meets these requirements. For example, we offer secure, online interactive forms that can be filled out on any device with any browser. These forms are great for dental and medical offices! Additionally, we can integrate e signing with the forms; this allows businesses to fully automate contracts, applications, leases and more. Contact us today to find out more! Consumers and businesses today are faced with a decision: using primarily local storage or mostly online storage. Using online storage offers many benefits local storage does not. Online storage is the practice of storing electronic data with a third party accessed via the Internet. This method of storage is becoming increasingly popular. The art of data storage had humble beginnings. It began on the computer itself, moved to floppy disks, then to portable USB thumb drives. Now, online storage is available. A big advantage of using online storage is portability; it is easy to lose or damage a hard drive or thumb drive. This is not possible with online storage. Online storage is ideal for the 21st century information age. Online storage makes syncing your devices easy; you can access the same document on your smartphone as on your tablet without a hassle. Consumers can use this to share pictures with loved ones, for example. You can access your files anywhere. Additionally, if something happens to your device, you can still access the files by re-downloading them. However, if you use a USB thumb drive and it is destroyed or lost, the information is gone. Cost: You can get more space at a lower cost than portable storage. Invisibility: Your storage won’t take up physical space in your home or office. Security: Your information is private and secure. Share with others via secure links. Automated backup: You can choose which information to be backed up online and when. Accessibility: You can access your data from any device—no need to carry around a USB drive. Syncing: You can have the same data on all your devices without struggling. Collaboration: You can work with your co-workers easily. Protection: Most online storage has two layers of protection. Recovery: If the data in your office or home is destroyed, you can easily access it from the internet. You will find online storage beneficial for whatever you need, whether it is business or personal needs. If you’re in sales, you’ve probably heard the term, “Always be closing?” Essentially, it’s a sales strategy that refers to completing the sale. If, like most companies, you rely on signed contracts for new business, why not use technology that is readily available to close new sales faster and easier? Estimates, proposals and contracts are easy to send – and get signed – when done electronically via e-Signing. Tired of feeling like you are constantly “chasing” the sale with continuous follow-ups? With e-Signing, you no longer need to call or email your prospects to find out if they received your proposal. Documents sent electronically through e-sign services are tracked, so you can see when people receive, view, sign and return them. Keep track of documents easier. Eliminate the need to print, fax or file papers. In today’s world of global commerce, you may never meet your potential customers face-to-face. In today’s world of modern technology, faxing documents to clients seems archaic. You fax them…they sign…they fax back. It’s a time consuming process with room for operator error and delays, especially if you need multiple signatures! Don’t let distance get in the way of closing a deal. E Signing works in every time zone, allowing documents to be signed and stored securely in minutes. When you work in sales, your paycheck depends on the number of deals you close. 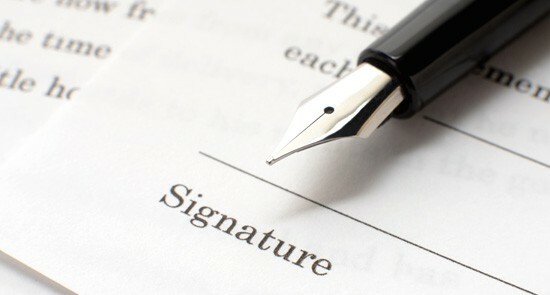 Make sure it’s as easy as possible for your prospects to sign contracts. With E Signing, it just takes a few clicks and you’re on your way to signing a new client! Companies cannot survive without new business. By sending contracts, proposals and estimates electronically via E Signing, customers can sign and return documents quickly and easily so that your business can carry on. Contact us today to get started!